Can You Get Eating Disorders Help? Yes! Yes, emotional eating is why 98% of all diets fail? Do you have an eating or a weight problem? Do you sometimes feel that it’s you and Chips watching TV together? Have you dieted and dieted and found no change on the scale and then wondered if the scale was conspiring against you? Do you feel that food is sometimes chasing you through life, like you can’t stop thinking about it? Always wondering what are you going to have for breakfast, lunch, dinner, desert? Have you been depressed about your weight? Is there one or more foods that rule your life? Do you eat when you’re bored, frustrated, happy, unhappy, or anxious? Have you wondered if you might be your own worse enemy? Do you start the day with great intentions and finish it with a binge? Do you begin eating something and can't stop until it's all gone? If you answered “yes” to one or more questions you must read this e-book. If you answered yes to the question regarding emotions you have an emotional eating and emotional overeating problem and this book is a treatment of compulsive eating disorders. If you answered yes to the last question, you suffer from emotional binge eating. This book is the bible on how to stop emotional eating and eliminate binge eating. Eating disorders help is here! It probably sounds too good to be true, but the truth is that your brain is a computer that will give you anything you want in terms of managing your weight no matter what your past experience has been. Emotional eating is the reason 95% of those who lose weight gain it back. And emotional eating is the reason why most have difficulty losing weight in the first place. Statistically 8 our of 10 people over age 25 are unhappy with their weight. Why is emotional eating such a problem? Choose a low calorie snack such as celery. Take a deep breadth and count to ten. The list goes on and on, but isn't this just recycled advice left over from the diet era? What's it really got to do with emotional eating? Occasionally you'll find an expert point you in the direction of dealing with the stress that caused the emotion with which you have difficulty. But what does that do for those who eat when they are happy? or feel accomplished? Think about this for a moment. If you focus on the stressor (not that you won't eventually) there are an infinite number of stressors--each capable of causing an emotion. You'll end up endlessly fighting stress. What I've learned, from working with thousands of clients, is that the real stress is the resultant emotion from the stress. Let me repeat that! The real stress is the resultant emotion. The emotion is the real problem and when you discover how easy it is to deal with it, you'll wonder why you didn't think of this approach yourself--it's so obvious. This is the difference between this book and all others on emotional eating--The Scale Conspiracy is the only book that shows you how easy it is to deal "head on" with emotions and forget about food. How to have a successful experience with any emotion so you can stop diluting emotions with food. How to become your own best friend. Twenty six ways to shed weight naturally. New ways of handling unwanted feelings of frustration, boredom, confusion, upset… and even feelings of happiness—how to take them straight and stop diluting them. How to build self worth. How to leave excess eating emotional stress out of your life. How to use the power of hypnosis and self hypnosis to reprogram your brain. How to nurture the child within. A new free relationship with food. The last reason “a new relationship with food” will make it impossible for you to ever cheat again. You will become proficient at shifting (refocusing) your focus from food to the emotion itself which in the past you used food to dilute or avoid. Yes, you can stop emotional binge eating! You’ve read all the diet books, been on all the diets, and keep gaining all the weight back. Isn’t it time to get beyond the yo-yo syndrome and stop emotional eating once and for all? The Scale Conspiracy is guaranteed to be unlike any book you've ever read with new information that will shift your relationship with food once and for all to conquer eating emotional. The Scale Conspiracy E-book and or the cd program is guaranteed to contribute to your overall life's experience or your money back. "Did you know that your chances of being "cured" of obesity are worse——much worse——than being cured of cancer? Study after study from the finest medical institutions in the world report that only 10 to 15 percent of patients who start out with the intention of losing weight have actually lost a significant amount of weight at the end of one year! By the end of the second year, about half of those are back to square one! Despite decades of research into the basic metabolism of the obese patient, which is clearly different from the metabolism of the non-obese individual, the long—term treatment of obesity remains one of the most perplexing, frustrating, discouraging failures of modern medicine. Clearly, there is more to this problem than the old concept of "calories in/calories out." That's not to say that the caloric balance is unimportant, but all of us know people who complain because they eat and eat and can't gain weight, and others who really eat very little and seem to gain weight just from thinking about food. The fact is, both those body types exist, and very little can be done to change them——they are the ex­tremes on a spectrum of metabolic activity, with many other gradations in between. That means that there are some individuals who have a tendency to gain weight but can be controlled by change——change in food in­take, change in calories expended by changing the ac­tivity level. In addition, there must be change in men­tal attitude for long—term weight control. It is this last change that Richard Kuhns addresses in this important contribution to the management of obesity. This book is chock—full of important insights into the mechanisms of behavior that lead us astray and in­terfere with our abilities to maintain control of the changes that are required for successful weight loss. I am amazed at the number of specific problems that have been covered in these general rules for identifying your problems and "getting your act together." This book is a treasure trove of truths——and the truth will set you free. I would go so far as to say that if every over­weight patient learned all of the lessons that are presented in this magnum opus, the success rate in treating their obesity would be dramatically improved." Writes Warren Levin, M.D. (Bariatric (obesity) Specialist) in the Foreword to the book. “This is a practical, common—sense, and interesting "holistic" approach to health and weight management. Richard Kuhns writes from the down—to—earth perspective of someone who has "been there" himself and came back with a wealth of helpful hints for the rest of us. He draws on an extended background of professional work in many health—related fields and freely shares his many trials and errors. From his expertise in hypnosis, we learn how ordinary words and phrases can keep us in a "fat frame of mind." He shares all the nutritional hints and psychological insights necessary to easily develop thin eating habits. Despite the completeness, this book does not read like a text book. Mr. Kuhns is not an academician but a reformed "fatty" himself. His own experience in self—change has led him first to pursue a career in helping others and now to publish the techniques that he has developed over 14 years in private practice to benefit a much larger audience. You can rest assured that these insights came' not from an ivory—tower researcher but from an individual who understands the problem of overeating from having been there himself and who is now writing down the directions from a little farther down the path. • How "being right" helps keep people fat. • The "dirty dozen" suggestions. • Nutrition in a nutshell. • How some foods or liquids trigger the consumption of other foods. • How the foods you like the most can produce an allergy—like food sensitivity, including some unpredictable recommendations to rectify the problem. "I have been listening to the tape as I sleep at night..................and have lost 12 pounds in two weeks! I have co-workers who don't believe me that it works but I am a total believer. I have noticed little things changing like wanting a glass of water when I wake up each morning. There is no other explanation as far as I'm concerned. 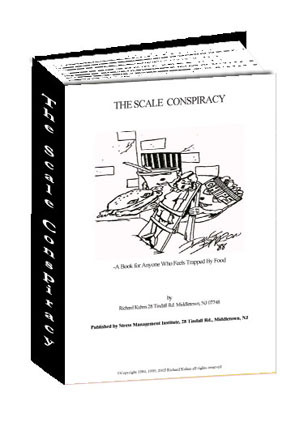 Want to get the Scale Conspiracy e-book for Free-read on! Pay by check or money order, mail, fax, or phone. Click here for other payment options.